World’s Most Famous Arena, located above world’s most depressing train station. Decades of pro wrestling history were upended via joint press release on Thursday when Ring of Honor, New Japan, and Madison Square Garden announced a joint show at “The World’s Most Famous Arena” for April 6, 2019. Unless an unannounced (but previously reported) planned show from Mexican promotion AAA materializes in the interim, that event will be the first non-WWE pro wrestling event ever held at the current MSG, which opened atop New York’s Penn Station in 1968. (Factoring in the other MSG locations, it will be the first non-WWE show since 1960.) The timing makes things more interesting still, as April 6 is the night before WrestleMania will be held at MetLife Stadium across the river in New Jersey. This puts the ROH/NJPW show up directly opposite WWE’s NXT TakeOver event at Barclays Center in Brooklyn. Oh, and earlier ROH had publicly claimed that WWE had gotten the date nixed. To understand what’s happening and why this matters, it helps to have some understanding of the dynamics of the WWE/MSG relationship and the annual WrestleMania weekend landscape. For most of its existence, WWE has had some kind of exclusive deal with MSG for wrestling, although that didn’t extend to the building’s 5,600 seat theater—originally the Felt Forum, now the Hulu Theater—which has housed shows from from other groups in the past. As a result of this deal, WWE’s competitors were always shunted to less centrally located venues—Roosevelt Stadium, until it was knocked down, and then the Meadowlands Arena and Nassau Coliseum. This hurt those promotions’ viability in the market, even when those rival groups had powerful backers like Turner Broadcasting and White Sox owner Eddie Einhorn. As the priorities of the wrestling business changed, MSG was no longer a monthly stop for WWE, but it still housed plenty of major shows; MSG-based pay-per-view cards were presented as bigger deals than those from other arenas, even those in the New York market. Even that, however, changed in 2005. There was an 18 month period where WWE didn’t run the Garden, only returning for a show on the fifth anniversary of 9/11, which opened with a tribute to New York’s first responders. In the September 20, 2006 Wrestling Observer Newsletter, Dave Meltzer reports that there had been a dispute over the increased costs to run the building. A Thomas Hauser article that Eurosport published the first week of 2006 quotes boxing promoter Bob Arum as putting the cost at $400,000 to “open the doors;” that appears to cover both rent and staffing as Meltzer had previously referenced a lower figure for just rent. 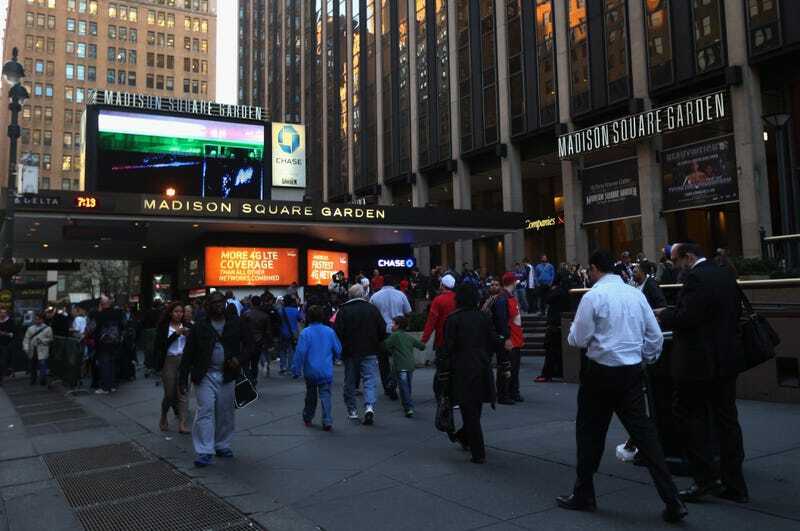 As the years went on, it got to the point where the additional fees that MSG charges to broadcast from the building made it untenable to run television tapings or pay-per-view events there. WWE did run a streaming-only special in 2015 from the building, but they otherwise haven’t run a pay-per-view there since November 2011, when The Rock made his return at that year’s Survivor Series event. Most years, what “The Garden” gets from WWE is a show a few weeks before WrestleMania, a Summer show, and a Christmas week show, none of which are televised. This is how it came to pass that during WrestleMania week, with WWE’s show of shows returning to the New York market for the first time in six years, none of the festivities were scheduled for MSG. MetLife Stadium gets WrestleMania proper, Barclays Center gets the arena events—Hall of Fame ceremony, NXT TakeOver, Raw, and SmackDown—on the four days that bookend the big show, and a local venue yet to be announced will house the Fan Axxess convention. Numerous other promotions run shows in the host city during WrestleMania weekend, with Ring of Honor, owned by Sinclair Broadcast Group since 2011, being the biggest. The annual Supercard of Honor event has shown significant growth in the last couple years, drawing about 3,500 fans in 2018 and close to 6,000 this past April. New York City, though, lacks the sort of smaller to mid-sized arenas that you find in many other markets—or at least ones willing to book wrestling—which meant that an attempt to top this year’s Lakefront Arena event in New Orleans meant that ROH would have to book MSG or Newark’s Prudential Center. That this is also an NJPW event carries its own significance: For over a decade in the 1970s and ’80s, the Japanese group had a strong working agreement with WWE, with executive Hisashi Shinma event serving as figurehead president of the American promotion. Madison Square Garden had a very specific prestige, with NJPW taping television at WWE’s MSG shows on occasion and even naming their annual tournaments the “MSG League.” Sinclair has the money to make a statement by booking what is at least in the public imagination the WWE’s venue, but it probably doesn’t hurt that NJPW has a unique historical and emotional investment in running “The Garden” as well. Koff told WTTE-TV in Columbus (a Sinclair station) that the building will be configured for about 15,000 fans. If the attendance tops 10,000, it will beat this coming September’s already sold out “All In” show—an ROH and NJPW-affiliated event that is technically independent—as the biggest non-WWE show in America in years. That’s not at all an impossibility: That type of card would already be a destination event even if 50,000 wrestling fans weren’t already flying into town for that other show in New Jersey. If Sinclair, Ring of Honor, and New Japan Pro Wrestling wanted to make a statement, they couldn’t have picked a better venue.